THE Venezuela side arrived yesterday in Port Moresby, Papua New Guinea the first to do so ahead of the Under-20 women’s soccer World Cup from Nov 13. 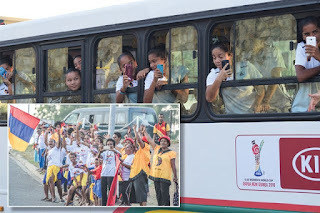 They were led by star striker Gabriela Garcia, who gave the thumbs up to fans, as her Spanish-speaking contingent filed onto a waiting bus to be ferried to their accommodation, where they will spend the next few days preparing for their Nov 14 group D opening fixture against Germany. 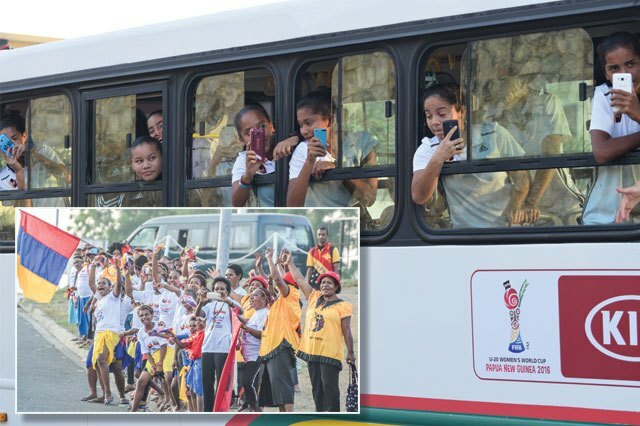 The contingent was welcomed by children from the local community, who donned Venezuela’s national colours and chanted as the bus passed them on its way to the Airways Hotel. Local organising committee staff also welcomed a Fifa contingent from Zurich, Switzerland. Venezuela are a gutsy side who qualified behind Brazil for the U20 edition of the World Cup. Among their contingent is U17 Women’s World Cup star Deyna Castellano, who has scored 25 goals for her country in the different age group sides, including six at last month’s tournament in Jordan. Three more teams arrive on Sunday, including the PNG U20s, who will wrap up a brief tour of New Zealand with coach Lisa Cole. The other two teams are Brazil and South Korea. Both Brazil (Group A) and South Korea (Group D) arrive on Sunday morning while Cole’s squad is expected after lunch. Brazil get their connection flight out of Singapore while South Korea fly in from Hong Kong. The hosts PNG will be coming off a tour of New Zealand which saw them go down to the Kiwis 8-0 earlier in the week but Cole’s charges put in better effort against the NZ U20 side, going down 2-1 on Wednesday. PNG play their third friendly tomorrow before returning through Brisbane the next day. On Tuesday, U20 women’s defending champions Germany, Spain and North Korea arrive in the National Capital District via Singapore, while Sweden comes in from Hong Kong. Nigeria flies in on Wednesday morning, with Canada, France and Japan arriving on the same afternoon. Next Thursday marks the last day of arrivals, with Ghana coming in the morning from Cairns, while New Zealand and Mexico fly in from Brisbane; USA head up from Cairns in the afternoon.